Several days ago, influential singer Morrissey was hospitalized in Michigan for an unspecified condition. Initial reports only indicated that his January 24-26 shows (Flint, Minneapolis, and Chicago) had been cancelled, and incorrectly reported the reason as “a bandmate’s illness.” At least one show, January 24’s scheduled Flint, MI stop currently has no rescheduled date and fans have reportedly been automatically refunded for their tickets. Billboard is now reporting that the true nature of Moz’s hospitalization is due to a bleeding ulcer and all tour dates between now and February 9 have been postponed, at which point the tour is expected to pick up in Las Vegas. This unfortunately includes Tuesday night’s stop at The Ryman Auditorium. 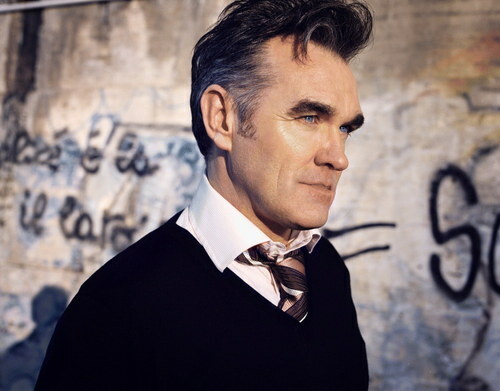 According to a statement from Morrissey’s rep, rescheduled dates will be announced in the coming days. Many of Morrissey’s upcoming shows had already been postponed from November and December, when the singer had to abruptly return to England to spend time with his sick mother. The Ryman has not yet announced the show’s cancellation, but we’ll be sure to update on their plans to reschedule and/or refund tickets as soon as they become known. I’d assume all tickets from Tuesday will be honored as usual for whenever the show is rescheduled. (UPDATE: The Ryman has officially announced the show’s postponement, with no new info aside from the fact that “For ticketholders unable to attend the rescheduled date, refunds will be available at the point of purchase.”) If you’ve been following our Morrissey coverage, you know that we were incredibly excited about the singer’s return to Nashville, and even ran a ticket giveaway contest back in the fall. I, for one, am very disappointed about the show’s last minute cancellation, but health comes first. Here’s to wishing the Pope of Mope a speedy recovery! I know it won’t completely take the disappointment of a postponed Morrissey show away, but it might make you feel a bit better to know that earlier this evening, NME published a quote from Mike Joyce saying The Smiths could still reunite someday.